At the Final Cut Pro Creative Summit, Apple announced its next big version if its highly powerful editing tool which is oriented towards editing professionals. The company’s editing software called Final Cut Pro X is now bumped up to the version 10.4. The announcement details were shared on Twitter by FCPX experts Alex Gollner, Richard Taylor and Peter Wiggins. The said personalities shared various aspects of the Final Cut Pro X and what users can expect from it later this year. So let’s dive in to see some more details on the Final Cut Pro X and what does it have in store for users. The first day of the event was quite huge as the company unveiled the next big update to its powerful editing software. While the Final Cut Pro X will be launched sometime later this year, there were no final dates designated. However, what we know about the release date is that it will arrive before this year’s end. So how will be the Final Cut Pro X 10.4 be different from what we use to date? The update will include a bevy of new additions as well as an update to the existing features. It will add new color tools such as a color and white balance picker. In addition to this, there are new controls added to the color board as well. As we all know iOS 11.1 and macOS High Sierra 10.13.1 will include the new HEVC and HEIF support for photos and videos, the new version of Final Cut Pro X 10.4 will feature support for the new formats. The new formats basically aim at reducing space while retaining the same quality. Above all, the Final Cut Pro X will feature support for VR and HDR workflows. Other features include 360 titles and transitions, color wheels, custom LUT loading, direct import if iOS Movie timelines and much more. Apple also shared several demos of the new version of Final Cut Pro X which in action also included the 8K timeline on the new iMac Pro. Apple’s Final Cut Pro is one of the most advanced and most powerful editing tools available on the market. It not only features an easy to use design, it’s powerful in its own right, allowing editors to perform more in a lot less time. We will let you guys know as soon as we hear more details on the subject. At this point, Final Cut Pro X is available on the Mac App Store for $299.99. This is it for now, folks. 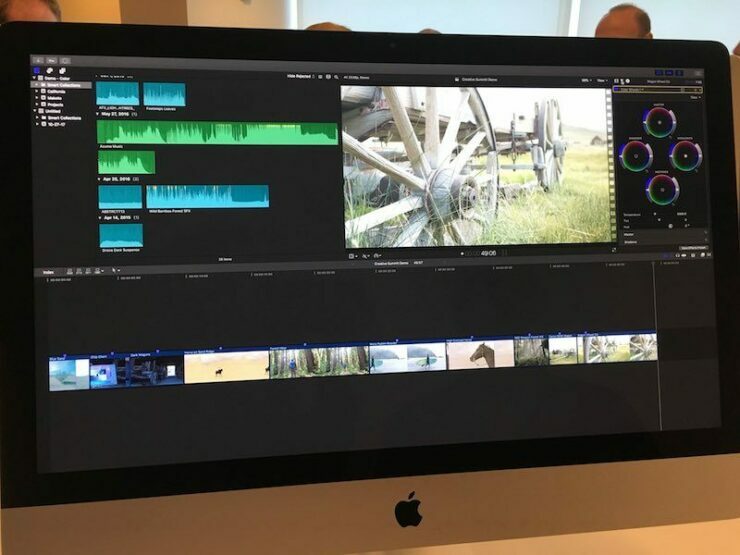 What are your thoughts on the upcoming Final Cut Pro X 10.4? Are you a Final Cut Pro user? How does it seem different to you compared to other editing tools on the market? Share your views in the comments.